Dehumidifier is an equipment used to decrease the relative humidity of a room to ensure that the moist space water molecules are reduced for the comfort of the occupants. The relative humidity(RH) shows the percentage of moisture in the air and different room temperature can hold different amount of moisture. Air that is high in RH will cause sweating and little evaporation and hence discomfort to the occupants. It also caused the growth of mould and mildew which cause health risks to the people in the house. Besides that, the humid environment is ideal for cockroaches, dust mites and moths to thrive. The dampness also creates an unpleasant smell in the room. A study shows that the typical RH that is comfortable to the human body is between 30% to 50% RH. Hence, using proper dehumidification equipment is crucial to ensure a healthy and comfortable environment in the homes or offices. There are basically three types of equipment that you can use. Refrigeration Type is the most common type of humidification system that is used in a typical household. It removes moisture from the air by passing the air over a cooling coil. This causes the air molecules to lose heat and condense. The water that condensate is then collected on a tray or discharge to the drain outside the house through a drainage hose. 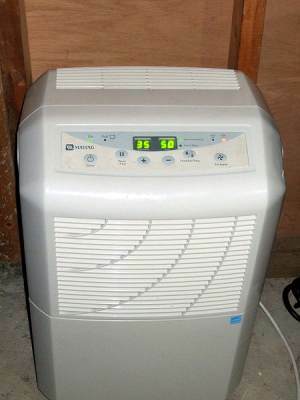 Air conditioner in your house is an example of this type of dehumidification process. It acts as a cooling equipment as well as reducing the humidity of the room. For effective removal of moisture, the dewpoint of the air entering the cooling coil should be higher than the dewpoint of the air leaving it. Dedicated refrigeration equipment usually consists of a compressor, condenser, evaporator and capillary tube. The fan motor draws the air towards the cooling coil and condenses into a pan or directly into the drain. The control that is used is called a humidistat. It ON or OFF the compressor and fan based on the condition of the air. It usually has features to indicate that the pan need to be emptied, the status of the unit, timer control, auto shut-off when pan is full, frost sensor to off the unit when frosting occurred, air filter to ensure only clean air is discharged to the room and variable fan speeds. The other consideration before buying is to check the noise level of the unit. Spray Type consists of a chamber that contains spray nozzles, tank to hold water and a water pump that circulates the water. The incoming air that enters the chamber is forced to be in contact with the water that is sprayed from the nozzles causing heat transfer between the water and the air. Dehumidification occurs when the temperature of the water is lower than the dew point of the air. This type of dehumidification process is able to absorb odor and cleaner air compared to the refrigeration type. Absorption Type is used in industrial application and uses sorbent material to absorb the moisture from the air. The material consists of microscopic pores that absorbed the moisture from the air. The liquid-absorbent type uses bromides or chloride brines in a chamber. The air is then directed to contact the brine solution with a vapor pressure below that of the entering air. As a result, the air that is discharged will be drier than the entering air. The reservoir of the tank that hold the water should be regularly checked and water should be emptied when full. Notice that the humidistat may cause the compressor and fan to switch ON and OFF regularly to remove moisture from the air, depending on the setting of the humidistat. Units that have piping installation to discharge the condensate water should be constantly checked to ensure that there is no leak on the joints of the pipes.